First and foremost this blog is about people... and thank you’s... This blog is about a journey which has been so much more than ‘vertical’, freezing-cold and oxygen-limiting...! Reflecting both on the extensive preparation for this expedition and the two-months spent on the snowy cold slopes of both Everest and Lhotse, this adventure has really been defined by amazing people that I have met along the way.... People who have inspired me, helped me, and joined me in some shape or form on this incredible adventure to the summit of the 4th highest mountain on earth. Some of these people have dazzled me with their genius and art. Others have shared with me insights about how I can live. Others have devoted their life to helping others. Some have conquered mountains while others have built business empires. Some are great artists while others have entertained with their brilliant musical talents. One thing that they all have in common is that they are passionate, talented, and amazing people who have added colour to my life and have helped to shape the moments that have made up this journey. Throughout this journey - both in preparing for the expedition and on the mountain itself, I’ve continued to be inspired by so many of the people that I’ve met along the way. These people have inspired me to push on to find additional strength and motivation to reach the summits of mountains – both real and proverbial – or make my way as far as possible up their snowy slopes…! 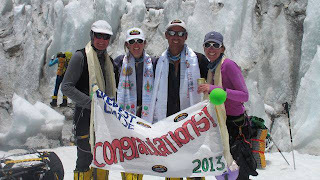 These people have included first and foremost, my fantastic AC team - both for Everest and for Lhotse. I’ve never climbed with a more talented, deserving and fun group of individuals. You are all amazing, talented, inspiring people. An especial thanks to Guy, Suze, Anthony, Ang Phurba Sherpa and Mark – thank you so much for sharing your incredible journey with me and for being such great team mates. Guy and Suze – for your fantastic sense of humor, Anthony for boiling water and being a great tentmate and Mark, for rubbing my back when I ate too much beef jerkey in C3 and Ang Phurba, for watching my back during our descent through the couloir..! Secondly, Thank You to my family. Thank you for your patience, your understanding and for supporting me no matter what. Over the course of the years and the many adventures of days gone by, this has meant so much to me and it’s such a tremendous comfort knowing that no matter what time of day or night I make the call, there’s always someone at the other end of the phone to offer a listening ear. I’d also like to extend a massive Thank You to Christine Mills and Alex Trapnell and the incredible team at Hope for Tomorrow. The amazing work and vision of Hope for Tomorrow and these passionate individuals has inspired me to ‘move mountains’ to help to improve the lives of those patients suffering from cancer. Hope for Tomorrow is a national cancer charity dedicated to bringing cancer treatment closer to home. Its Mobile Chemotherapy Unit's bring vital chemotherapy treatment closer to patient's homes reducing long distances of travel, waiting times and avoid the stresses and strains of having to travel to busy Oncology Centres. It has been such an an honour to be associated with Hope for Tomorrow and to see the results of all the charity’s efforts coming to fruition. A perfect example is today’s announcement of yet another mobile chemotherapy unit – one for East Kent hospitals University NHS Foundation Trust - bringing the total number of units on the road to 5. 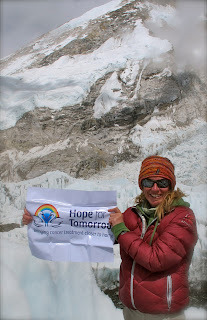 It’s fantastic to see the tangible difference projects such as my climb has made to the lives of so many people. Hearing the patient's stories and listening to Christine’s own personal account makes one appreciate the tremendous amount that Hope for Tomorrow has done to alleviate some of the stresses and strains of cancer for both patients and their families. The charity continues to raise the funds necessary to keep the expansion project on track and, keep its fleet of Units on the road and needs your support to put the 6th and 7th units into operation– so if you haven’t donated yet and are keen to show your support and make a concrete, tangible difference, please give what you can via the link below. Thank you SO MUCH. To Sherpa Adventure Gear family and the wonderful team at The Terrace in Kathmandu. 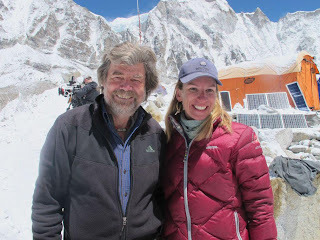 Thank you for all of your support both during my time in Kathmandu and over the course of the expedition. 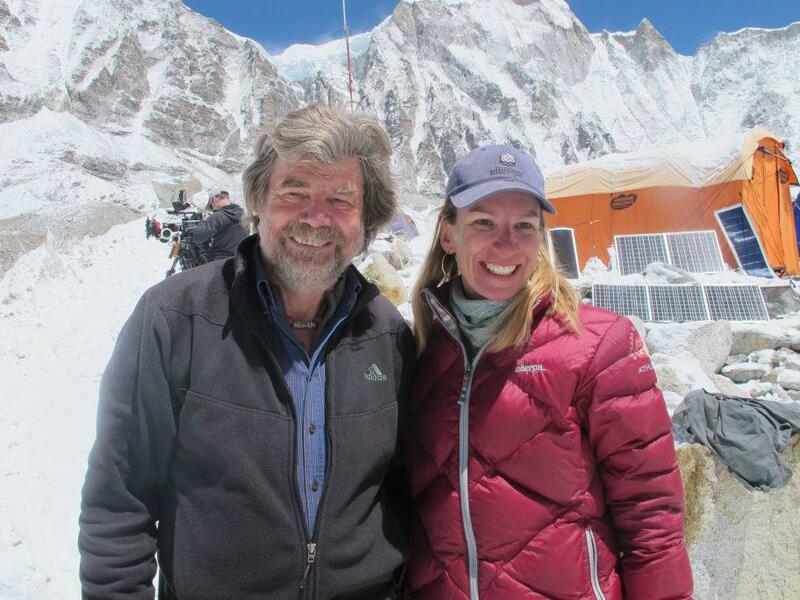 Thanks for making such high-performance, comfortable and stylish outdoor wear – every single day you kept me warm, dry, comfortable and most of all stylish under some of the most extreme conditions on earth – from cold days on the Lhotse face to audiences with Reinhold Messner. I’m so proud to be part of the Sherpa family! Thank you also for making the Terrace my home while in Kathmandu – I can’t imagine a more comfortable, modern and home-away-from-home..! I encourage anyone visiting Kathmandu to stay to make their visit of this vibrant city complete by experiencing a warm sherpa welcome in a hotel both owned and operated by the Sherpa family. 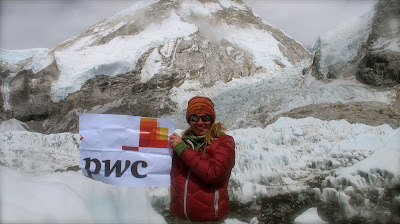 Thank you to my fantastic colleagues at PwC. People always ask me if I struggle with ‘returning to reality’. I don’t because I am inspired to go to work and take on the new challenges presented to me both by the firm and its clients on a regular basis. Meeting people, working with people, learning from people, joining forces to bring structure, creativity and addressing issues is just one of the highlights of my life – fortunately this is inherent to my job..! Finally, thank you to Danielle Sweeney Designs, Charles Finch and the team at CHUCS Dive and Mountain Shop, Katy Biddulph from Striders Edge, the girls from the Sisterhood, Laura / DJLora and Kenton Cool for all of your advice, patience and support and most of all friendship. Thank you for making me laugh and giving me the extra boost I needed every once in a while to remind me to look to the snow-covered mountain peaks and follow my dreams. Without the tremendous support of each and every one of these individuals life would not be nearly as fascinating and mountains would be significantly higher.